Tired of working countless bingos, selling (or buying) books of raffle tickets, and bottle drives? Try Kronos on for size! Our club's goal is to provide professionally coached training programs, at high quality facilities, with very reasonable fees and volunteer/fundraising commitments. our largest source of fundraising! 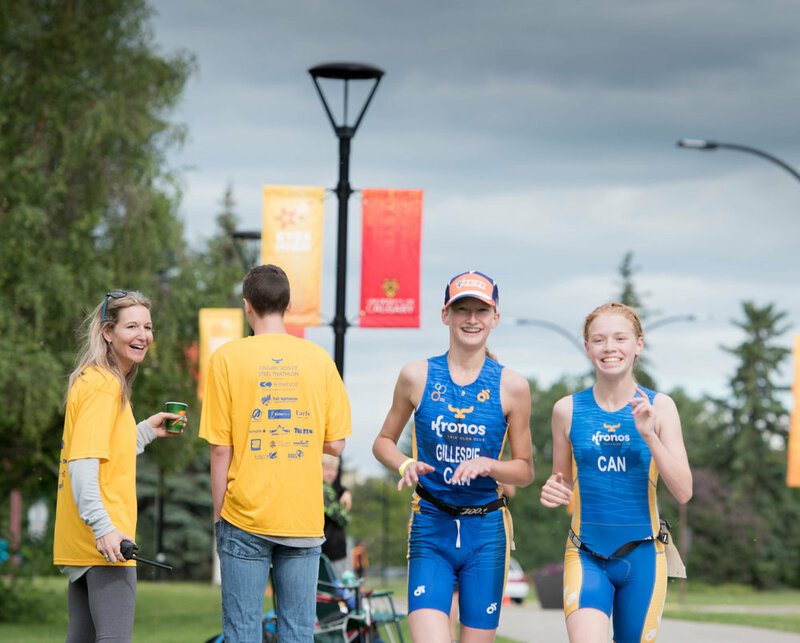 A half day of volunteering at our annual Calgary Kids of Steel race, hosted & operated by the Kronos Triathlon Club each year in June. our largest source of new athletes, and all proceeds go towards supporting Kronos programs! Kickin It With Kronos - an adults only party and silent auction open to members, family & friends! Fall Fundraiser - details TBA, typically a raffle event or sale of products to support the club. For certain programs, athletes and their parents are also required to earn volunteer credits through general club volunteering, or helping out with key events (internal or external). Kronos requires a volunteer deposit, which will be cashed at the end of the season should any of the volunteering or fundraising requirements not be met. In addition to our minimum volunteer requirements, many of our parents and athletes choose to go above and beyond to support the club. For those eager to help, we have many opportunities with our board of directors, Kinetico Kids of Steel event, various committees, and 3rd party race events that offer direct support for our club. Volunteering credits can be earned by the athlete, their parents, siblings, extended family or friends. Age restrictions may apply for certain opportunities. The following are examples of typical volunteer credits. Bring an additional volunteer (family, friends etc.) to help with Casino, CKOS, or another Kronos sponsored race.